Here is a food for thought. 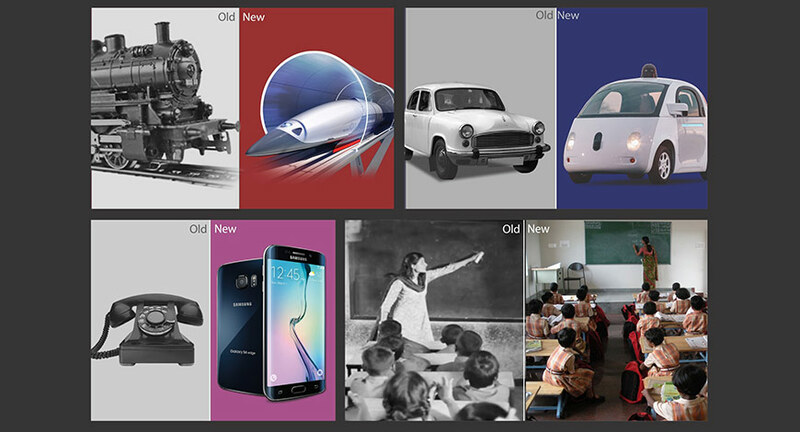 If our phones don't look the way they did in the past, our cars are going driver-less, and we are moving towards developing hyper-loop for super-fast intercity transportation, then why do our classrooms look the same? The world that we live in now is different to that of 20, 10 or even 5 years ago. The way we get and share information has entirely transformed, and the new generations are accustomed to having incredible computing power at their fingertips. This rate of transformation is not set to slow down at any point; in fact, many of the students today are expected to go on jobs that don't exist yet. Easy access to technological platforms has brought a social revolution where more and more children are shifting from consumers to creators. A recent Nesta report suggests that more than 50% of young people are making Digital Pictures, Edited Videos and visual effects, Music, Animation, Games, Web sites, software and Edited Pictures. Majority of them are also involved in making Remixes and Mashups, Mobile Applications, Robots, and 3D Printed objects. To support this diverse nature of making, creating, tinkering, it's time that we move from our traditional education system which is based on 3 R's of learning, Reading, Writing, and Arithmetic. Innovation has led to the spurt of entrepreneurs who are making the world an easier place to live. It involves risk taking, critical thinking, and creativity, which are vital to gain a competitive edge. In a study by Forbes where they asked more than 100 top HR and recruiters about the important skills for entry-level job seekers, nearly all of them said soft skills, "We look for candidates with a solid foundation of soft skills and trust so that the rest can be built upon it." Few of the traditional soft skills include creative problem solving, communication, and collaboration. These skills collectively build the foundation for 21st Century Skills, which have been recognized as necessary for success by educators, business leaders, academicians, and government agencies. In the rapidly changing landscape where the new jobs are emerging in different fields of Automation, Artificial Intelligence, Internet of Things, Unmanned Aerial Vehicles, it is important that students must be prepared as multi-literate citizens competent to work in different environments. For teaching and learning in new age requires a new model of education. The new model is Creative Education. As the 21st Century demands a creative and interactive system of education based on individual needs and abilities. We have made it till here but we won't be able to move much far with the "One size fits all education system". Creative Education is a necessary reform which reinforces the existing educational structures by creative methods to promote student's learning. In a broad sense, it can be defined as a creative way of teaching, thinking and learning. Creative Education brings freedom in learning where students are free to choose what they learn, and how they want to learn and assess their learning. This supports innovative personality development, creative problem-solving, critical thinking, active collaboration, decision making, creator mindset, visual communication and helps in developing an entrepreneurial mindset. Visual communication is an art of conveying messages, ideas, and thoughts using visuals. In creative education, students get an opportunity to express their ideas and thoughts visually which stimulates their right part of the brain and boosts their creativity. A research in neurology estimates that 80-85% of our learning, cognition, and activities are channeled through vision. That makes it one of the most important forms of communication that needs to be developed at a nascent stage in life. Our past, present, have been deeply impacted by technology and future innovations are going to disrupt our current predictions of future. With the introduction of Machine Learning, Automation, Artificial Intelligence, the traditional jobs are replaced by machines and new jobs are emerging which didn't exist a decade ago. So, with such a noticeable technology integration in our daily lives, it's impossible to keep children away from what is going to be a crucial element for their future. It's time that we bring technology in classrooms and leverage its power to guide student learning and understanding of a subject. This is the challenge many educators have faced for a very long time, that is to create and apply the model of education that works best for their school environment. 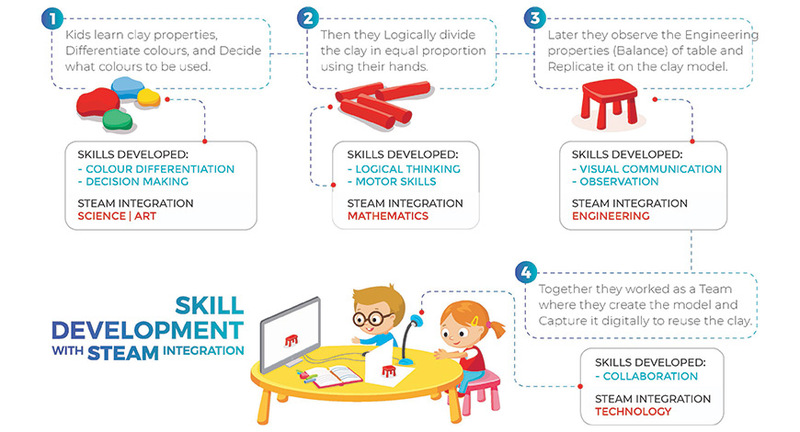 It can be introduced in classrooms by creating a student-centric classroom where students engage in experiential learning, DIY (Do-It-Yourself) activities, use Design Thinking as an approach to problem-solving; and adopt an interdisciplinary approach to learning where they learn a particular concept by applying concepts of Science, Technology, Engineering, Art, and Mathematics (STEAM). Let's take an example of the following project. In this project, students in the age group 6-8 years will be able to distinguish geometric shapes in 2D and 3D and measure sizes and proportions. The interdisciplinary concepts involved are Math, EVS, and Languages. They will learn to create the physical shapes using clay modeling and later apply their knowledge to create real-world objects like Table/Chair. This involves interdisciplinary learning of Science, Technology, Engineering, Art, and Math. It helps in the development of motor skills, observation, visual communication, color differentiation, and co-operation.